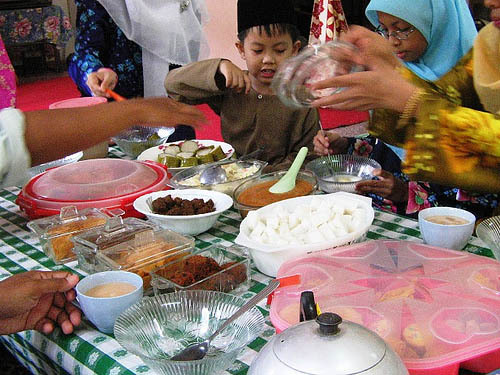 Source: http://en.wikipedia.org/wiki/File:Eidulfitr_meal.jpg. Copyright: see that page. Eid ul-Fitr is a Muslim holiday that marks the end of Ramadan, the Islamic holy month of fasting. Eid is an Arabic word meaning "festivity", while Fitr means "to break the fast". It is celebrated starting on the first day of the Islamic month of Shawwal. Shawwal is the tenth month of the lunar Islamic calendar. Eid-ul-Fitr is also a three day celebration. The Day of Eid ul- Fitr is celebrated by first attending the Mosque for Eid prayer. While the men are praying, the women are preparing a big breakfast at home with cookies, self- made bread, coffee, tea and so on. This is followed by visiting neighbours and family. Children receive presents and money from elder members of the family, relatives and neighbours. Most people wear new clothes, while biscuits, cakes, pies and tarts are presented to visitors as treats. Lunch is usually served in large family groups. Everybody is happy. We asked 28 young Muslims in Mülheim and all of them celebrate the Festival of the Breaking of the Fast. In almost four fifths of the replies they or their parents come from another country and 53.9 percent celebrate it differently there from here in Germany. The difference is that the atmosphere is better and they fete it with more people, like neighbours and the whole family. All of them fast, but 14.3 per cent not always, and for most people it's not hard to fast. To the sample of the survey this day means much, because they are together with the family, they get presents and money and have much to eat. 85.7 per cent think that the holiday has not changed and they celebrate it like their parents and grandparents. But the ones who said it has changed say that they fete it with more people and friends and for all of the young Muslims who we asked it's a special day. The final result is that almost nothing has changed in the celebration of this holiday by young Muslims in our town; it's a special day and it means much to them. Eid Ul Fitr is the Muslim celebration of the end of the month of Ramadan. This means it is the breaking of the fast that had consisted throughout the month. During the fast they are given strength and plenty of help from Allah to get through the day without eating. When Muslims celebrate Eid they are not only breaking the fast but are also thanking Allah for the help and guidance he has given them. They believe that Allah helped them with their self-control and discipline and that it would not be possible without him. Therefore they have many things to be thankful for. This ceremony was first celebrated in 624 CE by the Prophet Muhammad and his friends and family. Eid is also a time for forgiveness by Allah and to put things straight and make amends. To know when the start of the month Shawwal (the month following Ramadan) is, the Muslims look for the first sight of the new moon. This represents the 1st Shawwal. To celebrate the festival they wear their new or best clothes and increase the joyous atmosphere by decorating their homes. To celebrate there are special services in the mosques and outdoors. There are also grand processions through the street for everyone to see. And of course to break the fast you need to eat in daylight hours so they all have a big feast with their families. I think I can empathise with this a little bit because as a Christian I normally give up something during lent. However this is not as dramatic as not eating during daylight hours because it is normally something like chocolate or crisps. For Christians lent is a time of preparing the way for the lord and getting ready for Easter. It is not obligatory to give something up during lent but is simply thought of a good way to prepare the way for god because it is being more like Jesus. This is because Jesus fasted for 40 days and 40 nights during lent. Similarly the end of lent is marked by Easter, the date of which is also set by the new moon. As Christians we celebrate the resurrection of Jesus Christ. Whereas Muslims first celebrated this when Muhammad gained victory at the battle of Jang-e-Badar. Eid-ul-fitr, often abbreviated to 'Eid', is an Islamic holiday celebrating the end of the holy month of Ramadan, when Muslims fast to show dedication. 'Eid-ul-fitr' translated from Arabic means to 'break the fast'. Eid-ul-fitr is a three-day long celebration that starts on the first day of the Islamic month, 'Shawwal'. The Qur'an commands Muslims to complete their fast on the last day of Ramadan, and then recite the 'Takbir' throughout Eid. In the United Kingdom, Eid-ul-Fidr is not recognised as a pubic holiday, but if you are a Muslim who lives in a large ethnically Muslim area, sometimes schools and businesses make exceptions for the three days off. In the rest of the UK, Eid does not have a fixed date, as it depends on the sighting of the moon the night before. At the start of the day, men usally wear Throbe, Jubba, Sharwani or Punjabi, wheras women tend to wear shalwar kameez, a outfit consisting of wide, pajama-like trousers and a long shirt or tunic. After the men have gone to the mosque for traditional Eid prayers, people greet and hug each other. After the greetings, people head for a local cemetery where they can remember and pay respect to the dead. After this, Muslims will return home to greet their family and friends. Muslims cook traditional meals for their relatives, often containing Samosas, Rice and Handesh. Personally, I feel that Eid-ul-Fitr is an excellent approach in connecting the community in a healthy and positive way. As a Christian, my alternative to Ramadan would be lent, as it is traditional to give up something, but I don't feel it is in any way as dramatic and disciplined as Ramadan. The Christian alternative to Eid-ul-Fitr would be Easter, as we are celebrating the end of lent. However, I do feel Easter has become very commercialised in the modern world, for example, when you say the word Easter to someone, they are sadly much more likely to think of 'Cadburys' than Jesus' battle with Satan! However, Eid-ul-fitr has managed to stay religious and true to its meaning.